Many years ago (since always) I thought I couldn't rock a nice leopard print. It had to be the right shade, good spots, and the perfect fabric as well. Most I ever saw looked a bit cheap (no offense to the leopards). Anyhow, I went from not owning a think of leopard to suddenly owning two of the best I've ever seen. 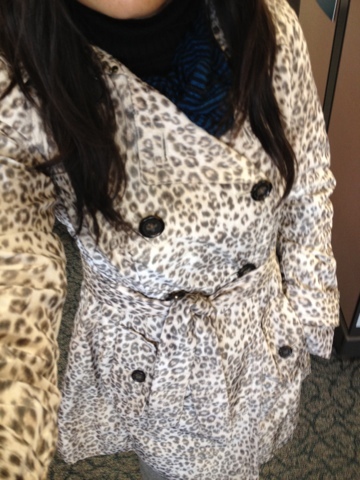 Pretty proud of my MADMEN collection double breasted leopard coat from BANANAREPUBLIC and my Sam Edelman wedges that my good friends loved and thought I'd love too. They know me so well ;) love them, and since then I can totally see accessories and the animal print with a different eye. Paying homage to the beauty in natures wild animals: to a fierce leopard print!